Starting around Black Friday every year, the light intensity in American suburbs increases by 30 to 50 percent, and it doesn’t return to normal levels until after the start of the new year. The reason? Christmas lights, which are so prevalent as to be directly observable from space, according to NASA. All that extra lighting costs money, and as you plan your own Griswoldian masterpiece, you may find yourself wondering just what the impact on your holiday utility bill will be. We here at Wonkblog’s northern Minnesota bureau have been wondering about this since we put our lights up several weeks ago. We know, for instance, that LED lights are a lot more efficient than traditional incandescents — but how much difference does that make over the course of a season? The immediate takeaway is that old-style incandescent bulbs cost a lot more to run — and this is especially true for the larger bulbs. 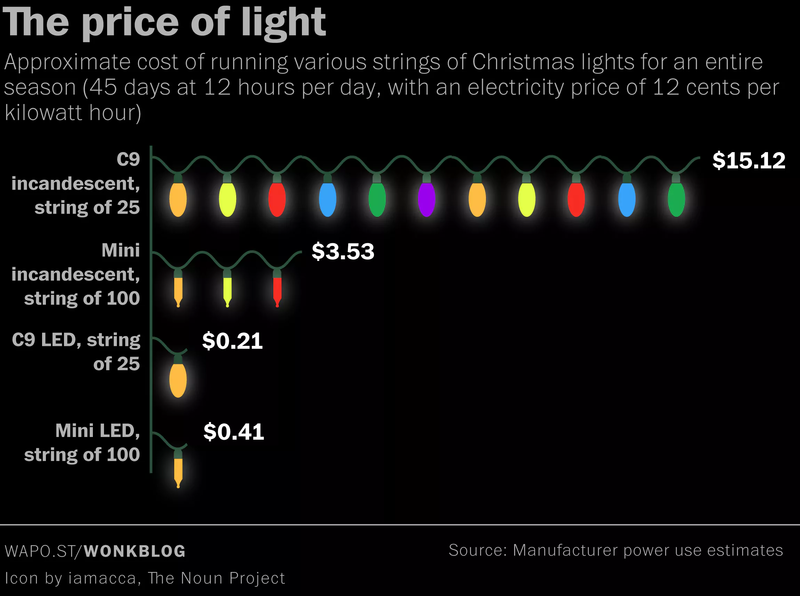 A string of 25 incandescent C9 bulbs — the big plump ones often used outdoors — uses 175 watts of electricity, which works out to a whopping $15.12 to run over a season (assuming 12-hour-a-day operation for 45 days). A comparable string of C9 LEDs, by contrast, uses just 2.4 watts and costs 21 cents to run over the same period. The price differential for the smaller mini-bulbs is less extreme but still significant: 100 incandescent minis will cost about $3.53 to run for one season, while LED minis will cost just 41 cents. So let’s say you want to run a total of 10 strings of 100 mini-lights this year. Running incandescents will set you back about 35 bucks over the course of the season, while switching to full LED will cost just a bit over $4. The real savings come if you’re using the big C9 lights, however. Running four strands of 25 incandescent C9s will cost over 60 bucks for the season. If you swap those out for LEDs, your electricity cost shrinks to a little over 80 cents. A recent study of nighttime satellite imagery concluded that as cheaper LED lighting becomes more widespread, consumers are responding not by pocketing the savings but rather by adding more light. That probably applies to Christmas lighting as well. Just think: For the price of running 25 incandescent C9 lights for a season, you could instead run a whopping 1,800 LED lights of the same size.